The Ripley’s Believe It or Not! annual has now firmly established itself as a Christmas must-have, with an ever-growing army of loyal fans. 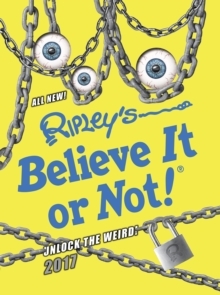 Following hot on the heels of last year’s Top 10 best-seller, Ripley’s Believe It or Not! 2017 offers a completely new compendium of strange but true facts and amazing stories, ranging from the Polar Bear robot, to the edible human skull, to the woman who still suffers from sea-sickness three years after her last boat trip, to the Swiss daredevil who soars over famous landmarks in his custom-made jet pack. Packed with amazing photographs and jaw-dropping facts, and with an out-of-this-world 3D-effect cover, Ripley’s Believe It or Not! 2017 offers a feast of information and entertainment. Prepare yourself for this year’s collection of eye-popping oddities!